My big beef with Capcom, as a mobile fan, is that I never really know what level of effort to expect from them. I consider them responsible for some of the finest ports to iOS (Monster Hunter Freedom Unite, Ace Attorney: Dual Destinies) and some of the worst (Mega Man Mobile, Mega Man X). Since the games they choose to port are selected from their excellent library of classics, it’s hard not to get excited when they announce something new is coming. But somewhere in the back of my brain, I worry that we’re going to end up with another unreasonably poor effort. Such was the case when Capcom recently announced that they would be bringing four of their arcade classics to the platform. Well, the first one is here, and I’m happy to say that we got the good Capcom this time. 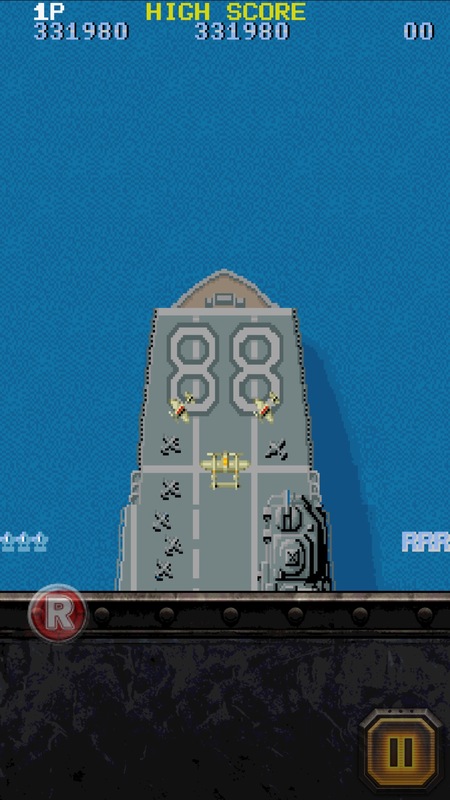 While it’s not perfect, 1942 Mobile ($1.99) is a very good re-creation of Capcom’s classic vertical shoot-em-up, with all that implies. So, let’s get the important part out of the way first. This is a good port. There’s no obvious lag as we saw in the Mega Man ports, the music is intact, and everything seems to be running at the right speed. I can’t say with certainty that this is the arcade version, but if it isn’t, whoever did the port did their homework. I compared it with the version of the game included on the old Capcom Classics Collection and other than the mobile version looking a whole lot sharper, I couldn’t spot any obvious differences. The mobile version includes a new casual mode that gives you a full assortment of power-ups with each new life and automatically pulls off the loop move if you take a direct hit, provided you have any remaining loops in stock. If you want to play it the classic way, you can do that too. The game keeps track of your level progress either way, allowing you to continue where you left off. The controls and gameplay adapt quite well to mobile, so if all you’re worried about is if 1942 Mobile is a good way to play your old favorite shooter, I can safely say your pocket change is well-spent. The next thing to consider is a bit trickier, which is whether 1942 is a game that people should want to play in the modern day if they don’t have any nostalgia for it. After all, it is the first game in its series, lacking many of the refinements and additions that came in later installments. It originally released in 1984, which puts it firmly in the middle of a period of significant advancement in the shoot-em-up genre. In a lot of ways, it feels as close to Galaga as it does to something like Tiger-Heli. 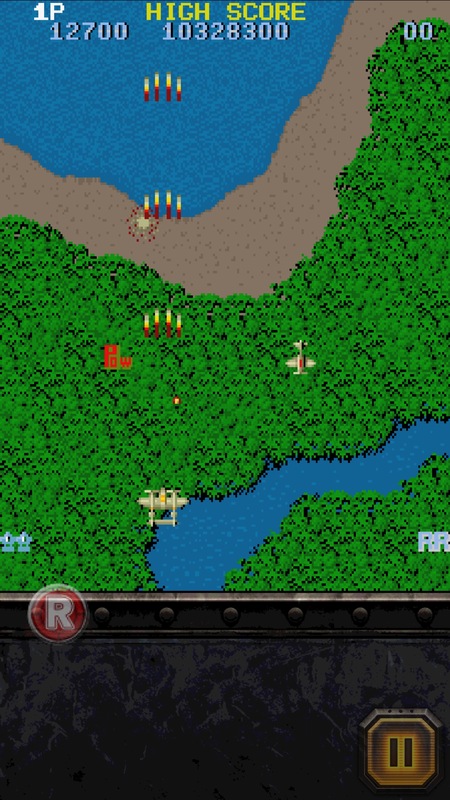 And certainly, if I step outside of the expectations of the modern mobile market, it’s hard to say that 1942 isn’t worth buying for a cheaper price than running a few rounds on the arcade machine. But we’re not really outside of those expectations, are we? 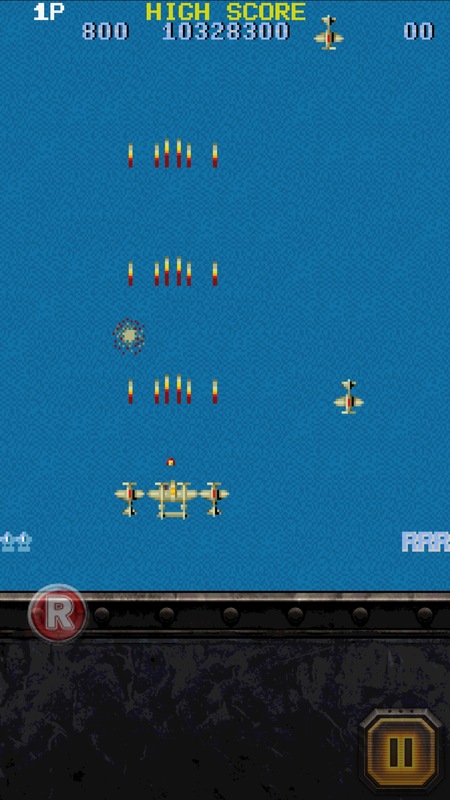 Unhooked from nostalgia, 1942 comes up short against iOS’s rather robust shoot-em-up selection. 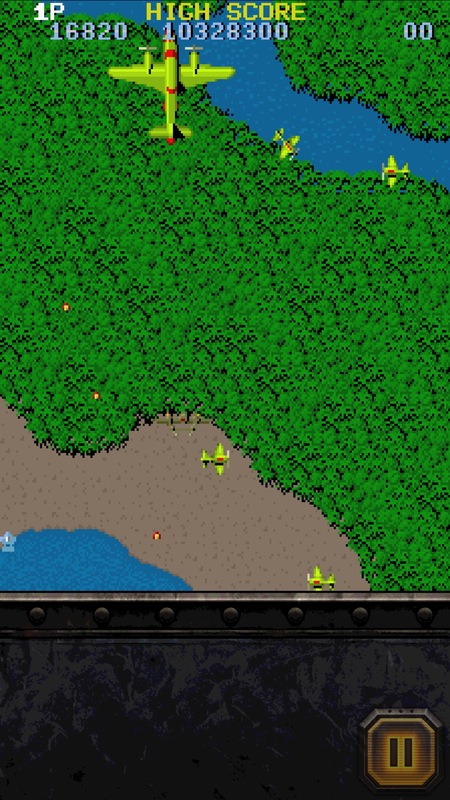 While its 32-stage campaign is long by almost any shooter standards, you’re spending most of that time soaring over the same bits of terrain, shooting at the same palette-swapped planes that run in similar patterns throughout the whole game. Occasionally, you get a boss to break up the action, but there too we find a great deal of repetition. In its time, its selection of power-ups was a somewhat unusual and enjoyable addition, but now, a powered-up shot and a couple of helpers feels quite meager. Don’t even get me started on the music, which tries to go for a marching band feel but ends up sounding like someone blowing a whistle in your ear at random intervals. Even its once unique theme has been done so many times that it certainly doesn’t help it stand out. The best argument I can make for the game is that it is still a pretty good challenge. In a sea of bullet hell games, 1942 Mobile feels fresh by relying on something old. The enemies will shoot at you, of course, and some of them fire enough bullets that you’ll have to move quickly to stay safe. The greater threat, however, is from the enemies crashing into you. 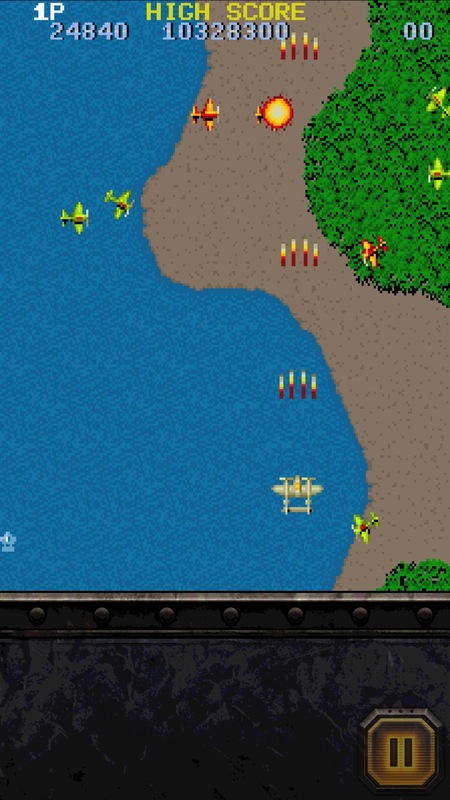 The enemy planes swarm in a similar manner to the aliens from Galaga, turning and looping around, sometimes exiting the screen only to re-enter it from an unexpected angle. 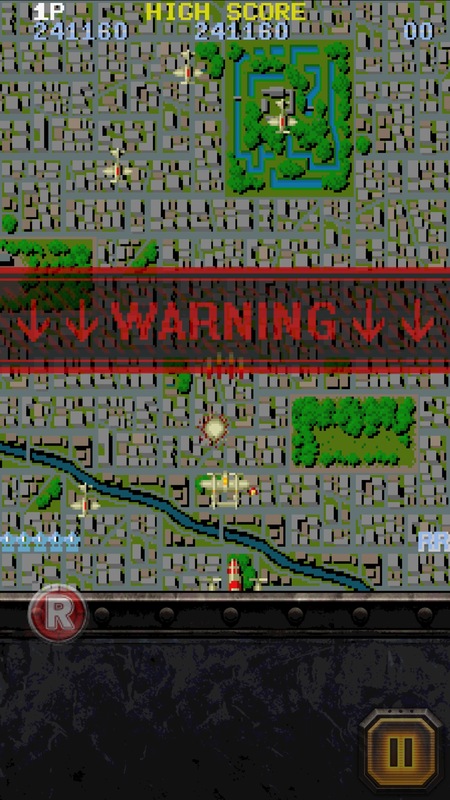 If you try to park at the bottom of the screen, you’re going to get hit sooner or later. So you need to take a more active role, dodging around to draw fire away and keep out of the way of enemy planes. There’s no curtain of bullets to squeeze between, but your hit box is a heck of a lot bigger than one pixel. Even with the casual mode and unlimited continues, you still have to exercise some serious skill if you want to make it all the way to Okinawa. As already mentioned, Capcom did a nice job with this port. The game uses relative touch for the controls, and there are a bunch of options including being able to adjust the speed of the plane. The casual mode is a solid addition, giving you a fully powered-up plane and having the loop-de-loop automatically activate if you take a hit. The latter is particularly useful, as it can be tricky to get your finger over to the loop-de-loop button with the necessary precision otherwise. The classic mode is presented as-is, but offers up a few options to mess around with, too. Progress in either mode carries over to both, so if you’re finding classic mode rough, you can flip over to casual mode and carry on from the farthest stage you’ve reached. Annoyingly, leaderboards and achievements require logging in on a Google Account. I’m sure everyone has one by this point, and I guess with Apple’s de-emphasis of Game Center it’s reasonable for publishers to look elsewhere, but it’s just one more thing to log into. There’s not much more to say about the game. If you were only wondering if 1942 Mobile was a good port as opposed to what we saw with the Mega Man train wrecks, you can buy the game with a clear conscience. It’s like having the arcade game in your pocket. If you’ve never played the game and are wondering if it’s worth picking up, I can say that it’s alright but it certainly feels like a game from its era in most ways. For the low asking price it’s fine, but don’t set your expectations too high just because it’s a big name.